Directed by Quincy’s daughter Rashida, the Tribeca-produced film provides unprecedented access into Quincy’s life. 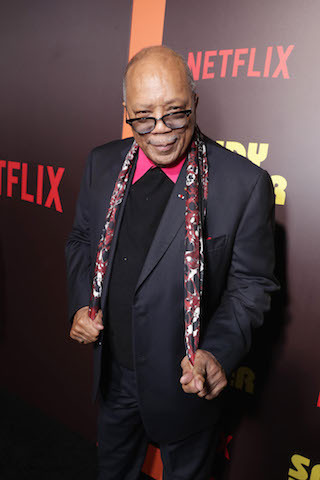 Netflix will air a new documentary which offers an intimate look into the life of icon Quincy Jones. Directed by his daughter Rashida Jones (“Angie Tribeca,” “Hot Girls Wanted”) and Alan Hicks (“Keep On Keepin’ On”), the film which is titled “Quincy” will launch globally on Netflix on September 21 and have a limited theatrical release. Named by Time Magazine as one of the most influential jazz musicians of the 20th century, Quincy Jones’s career as a composer, conductor, best-selling author, multi-media entrepreneur and producer spans decades and the film seamlessly threads personal moments with private archival footage covering his involvement in music and popular culture for 70 years. A trumpeter, producer, conductor, composer and arranger, Jones’s has discovered some of the biggest talents of the past half of the century and has mentored and cultivated the careers of young talents, from Lesley Gore and Michael Jackson to Oprah Winfrey and Will Smith. In 1985, Jones co-produced Steven Spielberg’s adaptation of Alice Walker’s The Color Purple, which garnered eleven Oscar nominations and marked his debut as a film producer. Throughout his career, Jones has received seven Oscar nominations and received the film Academy’s Jean Hersholt Humanitarian Award. Jones has won an Emmy Award for his score of the opening episode of the landmark TV miniseries, Roots, and in 2016 he received a Tony Award® for Best Revival of a Musical for The Color Purple.